When it comes to lodging in the North, economy doesn’t have to come at the price of variety. Consider the Travelodge by Wyndham Traverse City. An affordable national brand property, the Travelodge by Wyndham Traverse City offers guests an appealing choice of accommodations. 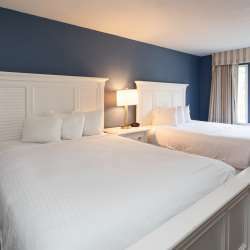 For couples seeking a getaway that puts them in the center of it all, the Travelodge by Wyndham offers clean and comfortable, single-bedroom units. Guests have the option of first-floor rooms that open right into the parking lot, ideal for those who want the convenience of walking directly to their car. For those seeking a little more privacy, Travelodge offers second-floor, single bedroom units. The property has 80 rooms in total. Families find a lot to enjoy at the Travelodge by Wyndham too. The property has eight, two-bedroom condominium units. Each comes complete with a full kitchen (pots, pans, etc. included), a spacious living room, and a private deck out back. 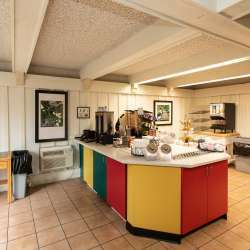 There’s also a two-bedroom apartment above the main office offering similar accommodations. The Travelodge by Wyndham also offers extra amenities not often found at similarly priced properties. The outdoor pool is a popular summer feature. There’s also ample parking for RVs. The property is pet-friendly, so four-legged family members can feel at home too.